Home › Home and Kitchen › Stainless Steel Slim Tumbler 30 Oz Cup With Compatible Lid & Straw - Double W.. Stainless Steel Slim Tumbler 30 Oz Cup With Compatible Lid & Straw - Double W.. Stainless Steel Slim Tumbler 30 Oz Cup with Compatible Lid & Straw - Double Wall Vacuum Insulated - Same Technology as Yeti - Premium Insulated Thermos - GUARANTEED to Keep Coffee HOT & Iced Tea COLD! ON SALE TODAY! ARCTIC-INSULATED DOUBLE WALL VACUUM TECHNOLOGY- Traps the cold for 24 hours and the heat for up to 6 hours! EXTREMELY DURABLE - Made from 18/8 kitchen grade stainless steel. Great for camping, parties, athletic events, canoeing, biking, running, hiking, and virtually every adventure you could possibly dream up. BPA FREE & ECO FRIENDLY - Safe, healthy alternative to plastic throw away bottles and solo cups. It is easy to clean with the Large, functional WIDE MOUTH and smooth structure for quick and simple washing. Corners are rounded so there are no hard angles where dirt can hide. Dishwasher safe lid, and hand washable steel body. 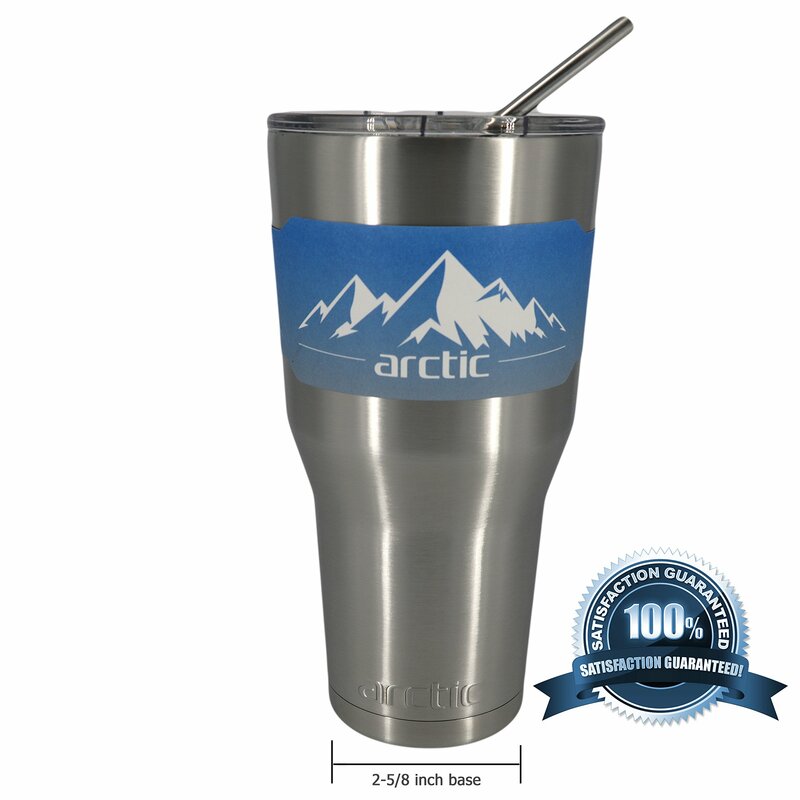 SWEAT FREE - The Arctic tumblers double wall construction design prevents any temperature transfer to the exterior. No matter what the contents - boiling hot tea water, hot coffee, or an ice cold beverage, the feel on this stainless vacuum tumbler remains constant! Size: 30 oz - Slim Version with Straw It's a hot sunny day, you're out on the water enjoying the sun and the lastthing you want is for your ice to melt or for your drink to get warm. Thanksto the stainless vacuum tumbler design, it will keep your drink cold for up to24 hours so you don't have to get up to refill on ice! This tumbler will alsohold more of your favorite drink with its large 30 oz. capacity! It's greatfor camping, boating, spending the day at the beach, tailgating and long carrides. In addition, this tumbler retains heat extremely well for your coffeeand other hot beverages! We guarantee your satisfaction - if this tumbler doesnot live up to your expectations just let us know and we'll make things right.Stop drinking out of an ordinary glass and start drinking straight from anArctic cooler!